My walls are cream. Well actually, they're almond white to be more precise! Which is why for a long time now I've been thinking about how it would be great to have a feature wall in my living room with a few prints, wise words and some black and white pictures and maybe one or two colourful ones here and there too. 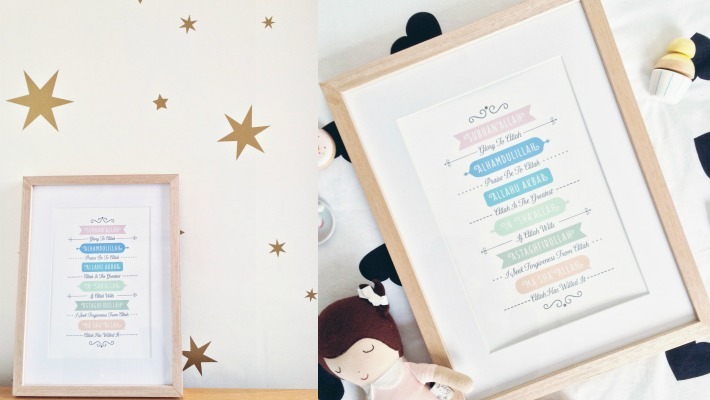 I'm thinking a collection of small to large sized frames, all mix and match, a bit Pinteresty you could say. So when Inspire Me Art got in touch with me, I was spoilt for choice. Their range of prints were too gorgeous and I didn't know which ones to choose. I did finally manage to pick a couple of beautiful pieces and although all the designs are available on canvas, I opted for prints instead. I have to say the quality of the prints is just amazing, the pictures really don't do it justice. Buying the frames was a lot harder than I thought it was going to be! You can tell I haven't done this in a long time or haven't done it at all! I chose a black frame for the design below and I think it fits perfectly with the colours. I love this quote from the Quran and it's definitely true too. Remembering Allah everyday helps in so many ways. My day is always more enjoyable and in some ways a lot easier too. I once read somewhere that if you put Allah at the top of your list then he will put you at the top of his list. Isn't that just so beautiful? The second frame was a lot harder. Well, I think I just made it a bit hard for myself really. I originally wanted a white baroque style frame because I'm going to be putting this one in my daughter's bedroom. I did buy one but unfortunately it was the wrong size! I'm pretty sure I measured it, but nevertheless I'm glad it didn't fit. Even though my vision didn't pan out, the wooden frame looks much better and brings out the colours really well. Looking at it now I don't think the baroque style frame would have looked as good. 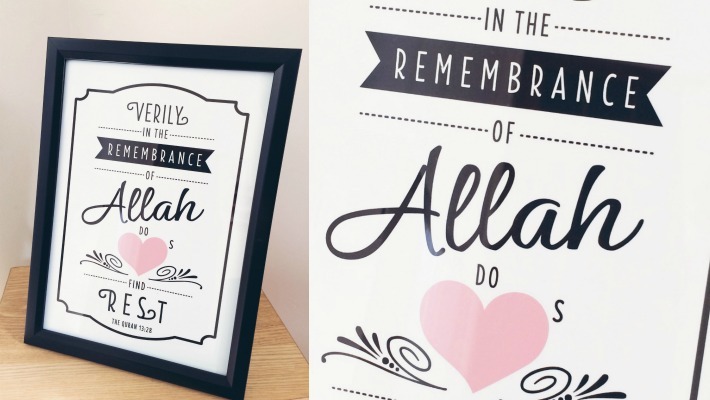 I chose to have this design with the supplications for my daughter's room because I wanted a little reminder for her everyday, to show her appreciation to her creator and teach her to be grateful for everything she has. For me, these supplications are extremely important because they will be with her for the rest of her life. I hope this is the start of my collection for my Pinteresty wall. It's been on hold for too long so I think it's time to get the ball rolling. By the way, in case you're wondering both prints are A4 in size and £19.99 each. This is definitely a good price since you can't beat the quality and that's what you want in a printed design. You want it to look amazing and that's exactly what this is. You'll be happy to know they do custom designs too. So if you're looking for something to match your home decor or a personalised gift then I'm sure Inspire Me Art will have something that's just right for you. Your blog is very inspirational and informative. Allah is at the center of every art form. 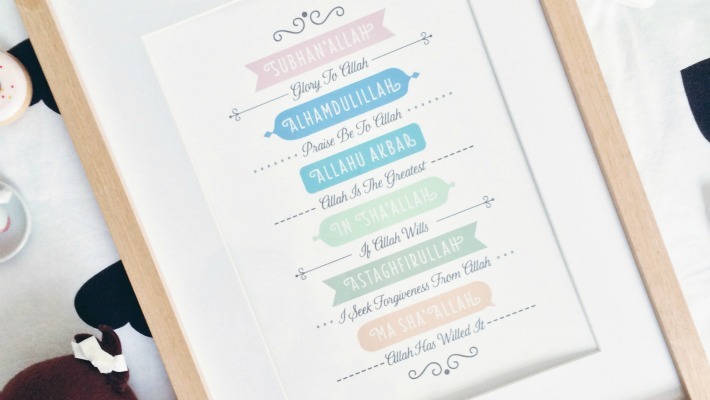 Islamic wall art also adds style to any room. This kind of elegant Islamic style art blends the traditional Arabic Stencils with contemporary elegance.